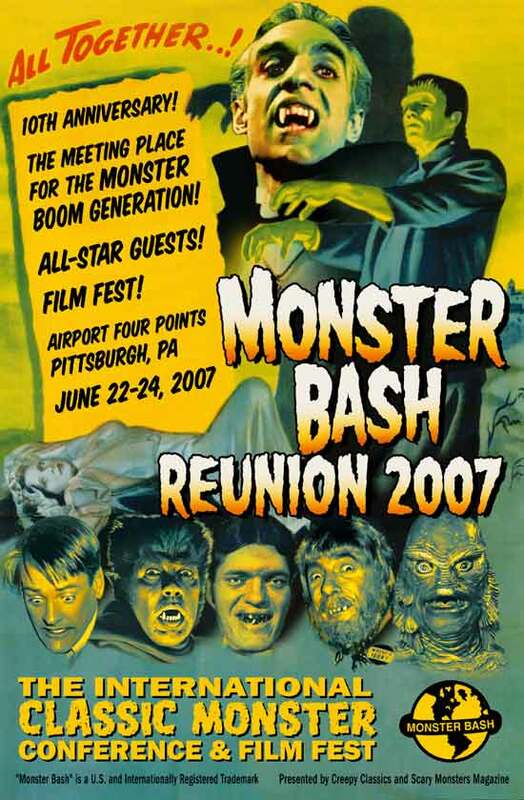 The 2006 Monster Bash featured Guests of Honor Elvira, German Robles, Richard Kiel, Ben Chapman, Kevin McCarthy, Chilly Billy Cardille, Dee Ankers-Denning, Laurie Mitchell, Ib Melchior, Son of Ghoul, Michael Thomas and many others. 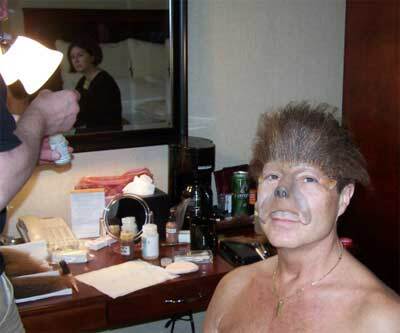 Michael Thomas did the make-up on Mark Statler, transforming him into The Wolf Man. 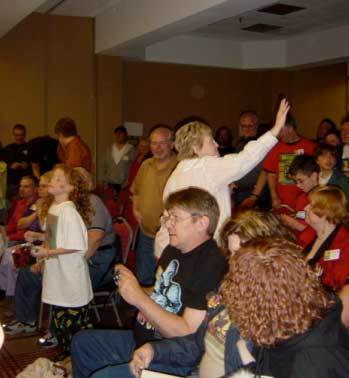 The Wolf Man then "attacked" Evelyn Ankers granddaughter, Summer, in front of the audience in a mock recreation of a scene from THE WOLF MAN. Tim Herron created the make-up of the Frankenstein Monster on himself and performed a selection of prose from Mary Shelley's classic book on stage. We unveiled the lifetime Monster Bash Award (MBA), known affectionately as "The Forry" for Forrest J Ackerman, sculpted by Daniel Horne. 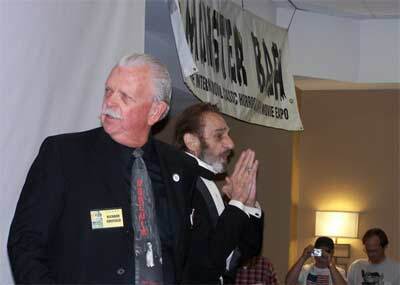 The first two awards went to Forrest J Ackerman and Bob Pellegrino for their unflagging support of Monster Bash. Photos provided by Barb Heiss, Robert Taylor, Patricia Gonzalez, Jim Clatterbaugh, Howard Harris, Maxine & Steve Wrzesien, and KevinSlick. 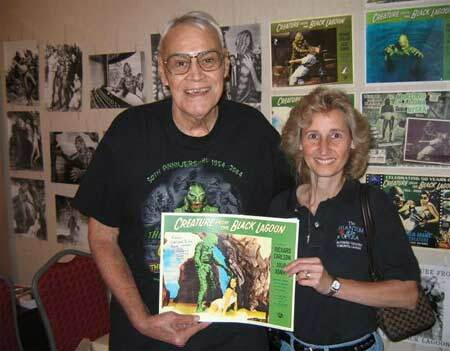 Ben Chapman (The Creature From the Black Lagoon) with attendee Maxine! 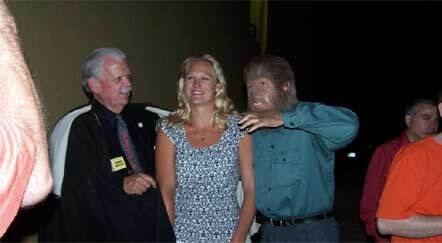 Richard Sheffield, Summer Denning (Evelyn Ankers granddaughter) and The Wolf Man (Mark Statler). 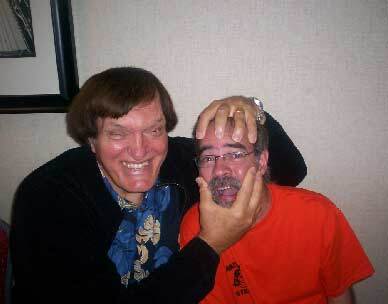 Richard Kiel single handedly worked-over every attendee it seemed....Robert Taylor gets "the business" here. 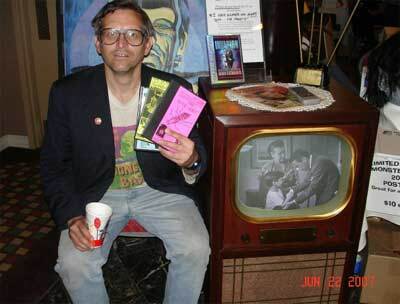 A calmer David "The Rock" Nelson this year hangs out near the Retro TV at registration with movies and java. Getting ready to Bash - Ron, Ursula and Kevin in the movie room. Richard Sheffield and German Robles on stage! 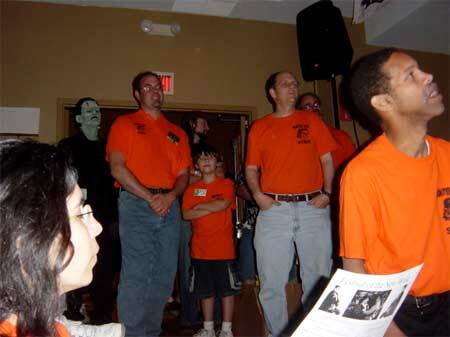 Another big event on stage is observed by staffers and Timothy Herron as the monster! 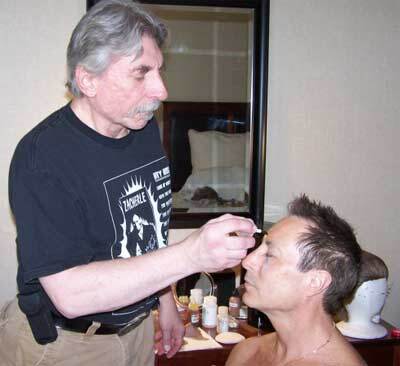 Make-up in progress on Mark Statler by Michael Thomas. Susan Arellino and Harry Hatter in the lobby. 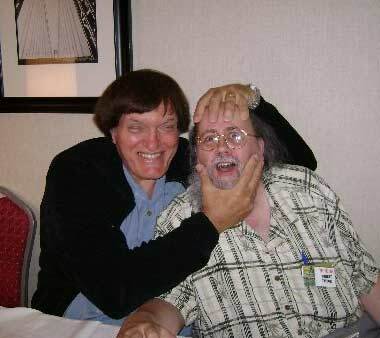 The incredible Michael Thomas about to turn Mark Statler into The Wolf Man! Free giveaways, contolled chaos in the Bash event room! 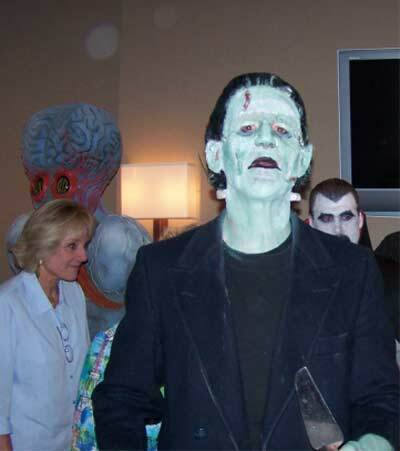 Timothy Herron as the Frankenstein Monster gets ready to cut the cakes! 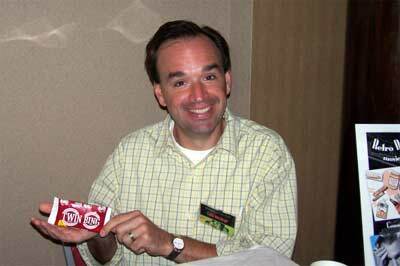 Tom Mizikar displays the "Twin Bing" candy from Iowa (courtesy of comedian Don Reese). 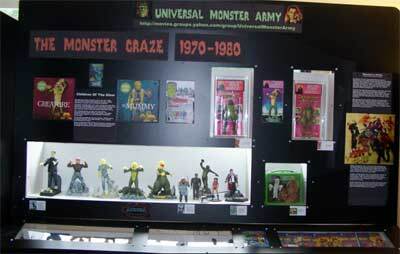 A small slice of the Universal Monster Army Museum room at Monster Bash. 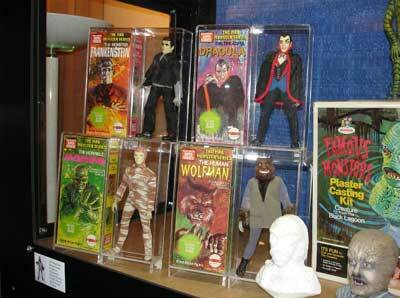 Mind-blowing memories from the Universal Monster Army! 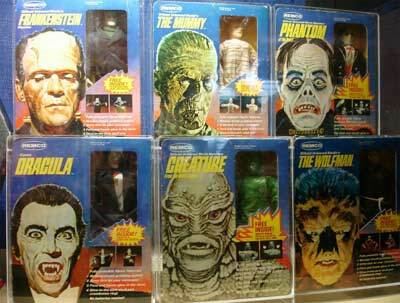 Just some of the many vintage toys on display by The Universal Monster Army! 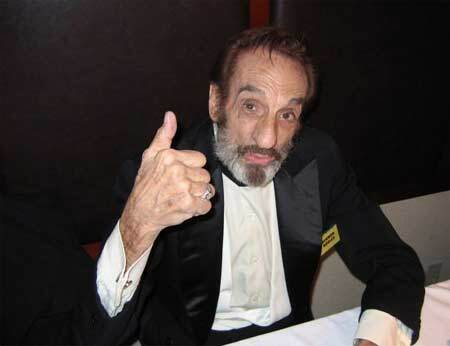 German Robles gives Monster Bash the "thumbs up!" 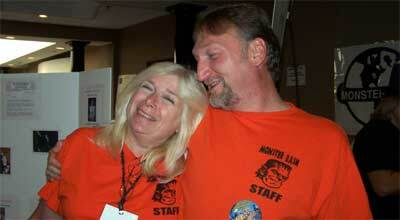 More Photos from Monster Bash 2007 - CLICK HERE!